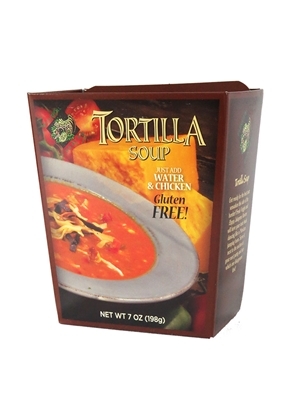 Plentiful Pantry Tortilla Soup is Plentiful Pantry's best selling soup! A slightly spicy tomato & vegetable soup. Sprinkle tortilla chips on top and you have an authentic Tex-Mex meal! Simply add water! Serves 6 people. Whisk contents of package into 6 cups warm water. Lower heat and simmer 20 to 25 minutes. Add a 12 oz. can of chicken or 1 cup of cooked chicken if desired. Dehydrated Vegetables (Onion, Tomato, Pinto Beans, Garlic, Corn, Carrot, Red Bell Pepper, Green Bell Pepper), Stone Ground Corn Masa Flour, Maltodextrin, Salt, Modified Corn Starch, Sugar, Cheddar Cheese (Pasteurized Milk, Cheese Cultures, Salt, Enzymes), Whey, Chili Pepper, Spices, Natural Flavor (Contains Torula Yeast), Buttermilk, Citric Acid, Powdered Cooked Chicken, Extractives Of Turmeric, Disodium Phosphate, Extractives of Paprika, Turmeric. Excellent soup! Very flavorful with a hint of spicy. Add Fritos to individual bowls when serving. May add pork, chicken or even beans and meatballs for variety. Perfect meal for a cold day! truly delicious..........and so easy and quick. When unexpected friends arrive I serve what I call my "assume soup", but don't tell them it's from a pkg until they begged for the receipt. I add cooked chicken, chips, chopped avocado and a little sour cream. Very good taste - not too spicy, not too tame! Had it with crumbled chips and sharp cheddar. Next time I will use chicken as well!